As many of you will know, this week marked the end of the shoot for the final episode of the final series of Agatha Christie's Poirot. If we include the rehearsed reading of Black Coffee, and assume that all the short stories of Labours of Hercules will be referenced in some way, we can conclude that David Suchet has now starred in adaptations of every single Poirot short story, novel and play ever published by Agatha Christie. That is quite an achievement. His last day on set must have been such an emotional moment, just like the end credits of the final episode, Curtain, will certainly be an emotional moment for all us fans out there. I'll offer some more thoughts on the subject once that episode has aired, but until then, suffice to say a big T H A N K Y O U to David Suchet for dedicating such a large part of his career to this funny little Belgian. This has been 25 years of excellence, 25 years of pure perfection. P.S. The photo I've chosen is from the Facebook page of Greenway Ferry. It was apparently taken shortly after they finished shooting the final scene of Dead Man's Folly. 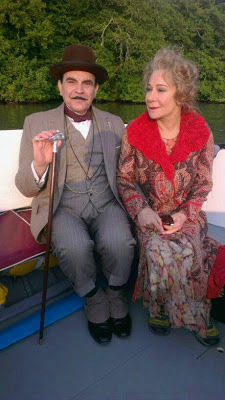 Notice how Zoë Wanamaker is holding David Suchet's hand. It must have been such a poignant day. I'm really enjoying reading these latest reviews and posts! Thank you very much for writing all of this! Ah, that photo makes my eyes misty. :( I love how supportive Zoë Wanamaker is of David Suchet. It does, doesn't it? :( But yes, they do seem to be such good friends! I've thoroughly enjoyed reading your reviews and posts on this extraordinary series about an extraordinary detective. Bravo to all involved on screen and behind the scenes of this amazing series over the past quarter of a century. Thank you! Nice to see that the reviews and posts are appreciated. Certainly - the entire crew deserve a big round of applause, too! An extraordinary project and an extraordinary achievement. One of my favorite parts of Sunday is catching up with your posts. I just finished watching, "Murder on the Orient Express," and was blown away with how they handled a very familiar story. I love Poirot and they have done an amazing job deepening Christie's original stories. I'm slightly heartbroken to think there soon won't be any more Suchet Poirot's, but I'm so happy they've been able to film them all. We are top web designing company in noida.